Why to Use Premium WordPress Themes? From the last couple of years, WordPress has become a vast and popular open source online journal and publishing platform. Plenty of premium and free themes, plugins have given a lot of traffic attraction, sales conversion and popularity to websites. After all, there are some of the great and appealing themes for WordPress. Generally, most of the free themes offer basic functionality and very simplistic designs, But in case of the premium theme, it’s not the same thing. So here are some of the benefits and suitable reasons that Why to use Premium WordPress Theme? If you’ve ever made an effort to reform or to modify a free WordPress theme, It’s the worst thing for you if you are not well versed with the HTML, CSS, and PHP because most of the free themes require at least working knowledge to change anything in existing free WordPress theme. In the case of premium WordPress theme, it’s different, Premium Themes are one lick design theme, button press changes that allow us to build up the professional quality website. A free WordPress theme allows you do the fixed amount of customizations, but in premium WordPress theme it’s not the same, here it comes at a price. Free themes have a tendency to be less adjustable and more limited in the sphere. The premium theme is constructed to blend or integrate the functionalities and features which your company needs. Our blog is set to be unique and stands out from the competition because of the customizations. Most of the websites use the common free themes which look great and better, but at the same time, the same theme is used by many other websites also just like yours. A premium customized theme gives your company brand and product and stands out from the competition. After downloading free WordPress theme it brings a surprise gift for you i.e malware because free themes are not updated extremely thorough and careful way as the Premium one offerings. Premium themes are verified by Themecheck.org it is an online check service which examines theme for both code quality and security. Premium themes powerful setup grand the permission to create unique looking themes for the websites all the demo files can be installed in one click with high privacy. For every website, ‘Traffic’ is the most important aspect. In order for your online business to flourish. The best way would be from the search engines of the website. HOW? Because traffic from search engines are profoundly focused hence immensely convertible. To get a part of traffic from Google, Yahoo, Bing your sites need to be raised for them. Its called SEO (Search Engine Optimization). Now the question arises what has premium WordPress themes got to do with the SEO? SEO outset on the website and its known as On-page optimization. If the WordPress template which you are using has inadequate coding and confusion to the search engines then you cant expect more cherish and result for them. In the case of free WordPress themes, this problem arises. Free WordPress theme is created by the inexperienced novice designer. On the other hand, Premium WordPress Templates are created by expertise and knowledgeable developers/designers. And because it’s for the use or purchase of products or services by a large number of people. All it takes a quick Google tour to go through reviews, ratings, and testimonials from current and previous users. Cost is one of the key reason for webmaster, online business owners that why they choose premium WordPress theme over custom designed theme? The main reason website owners are limited with the resources, not in every case but in most of the case, it’s true. The real fact is, To get a well-designed custom theme it will cost high, So if you are not ready to invest into it and raise the funds for the WordPress custom designed theme, then a Premium theme will do. It will cost you very less of what you pay for the custom designed WordPress theme. The problem is that owners risk their website brand if they don’t use the premium theme since all the free themes are used by many of the website owners. When you download and integrate the free theme into your site, You need to fix the issue urself. Free themes do not offer any kind of support if anything gets wrong during the setup or after the setup. In premium themes the scenario is something different, During the setup and after installing the theme it virtually always includes customer care and supports the user. If you run into any of the modifications, blackout or compatibility issues than you can directly contact the support team and they are available to give you the services. To stand out of the box and build a brand its essential we recommend to buy the WordPress Premium Theme. New WordPress premium theme is the best decision to increase the traffic, build the sales conversion and credibility with your visitors. When you purchase WordPress Premium theme, you will have to navigate the developers/designers to do the customization according to your need. This will be the great step towards the successful business. Premium WordPress themes are like progressions in the advancement of customization and SEO .These themes are programmed by professional designers and developers. This gives you the assurance that premium themes are compatible with present web standards. They are also viewable on all the search engines, so you need not to worry about the appearance of your website as it can be easily viewed in any browser. These are the advantages available if you choose Premium WordPress Themes for your website. Expenditure is one of the reasons why bloggers or web owners opt to use Premium WordPress themes over customized themes. Premium themes will cost you only a small section of what you pay for already customized theme. You can customize your premium theme very easily the way you want. This customizability is very appealing to the web owners who are not expert in coding and just focus on creating a good content to promote their product. When you invest in premium themes, you expect better standards and functionalities. Premium themes can satisfy you with their clean and optimized performance to make your site looks at its best. If you prefer Premium WordPress themes, then you can definitely expect a product of better quality, passivity and responsive design as compared to free themes. Web standards are consistently changing as per the ability of the search engines we use. So, premium themes are relatedly designed in coordination with recently upgraded web standards. Premium themes are designed with the perception of better functionality. Some of the best premium themes derive inbuilt user interfaces, which facilitate you to make changes in design and configure your site with one click. A greater section of free themes consists of packaged malicious code. These malicious hackers target WordPress websites to misuse uncertain websites to their advantage. You can largely avoid these security issues by purchasing Premium WordPress themes. There won’t be any security issues with premium themes. Premium themes are usually updated regularly with new features and functionalities of WordPress, whereas many of the free themes are out of date in the WordPress directory. However premium theme designers always keep their theme up to date with the latest versions of WordPress. None of the free theme designers has the responsibility to help you if you face problems with installation or customization of the theme. On the other side, all premium theme designers guarantee complete support in every aspect. This will save your time to search the web for the solution to solve your issues. With all the preferences mentioned above, purchasing a premium WordPress theme will be a smarter choice. Where to Find a Premium Theme? You can discover Premium Themes on two spots: either on WordPress.com Theme Showcase and right in your WordPress.com home page. How to purchase Premium WordPress theme? WordPress.com stores are obliged to provide you with beautiful and stunning Premium WordPress theme, which keeps on growing with the themes having additional features, highlighting various designs, appealing choices for customization, and selective support, specifically from the theme creators themselves. Having these perceptions in your mind you can purchase best of the premium themes. Premium themes can be purchased individually. Installing a Premium theme has got the same procedure as that of free themes. From your home page menu, explore Themes and tap on the Premium link. There you’ll see a recognizable network of all the accessible Premium WordPress themes. You can review how any theme will look on your site by clicking Preview → Try and Customize. The Purchase button will then show up at the top and you’ll be given a redesigned screen where you can buy that theme. 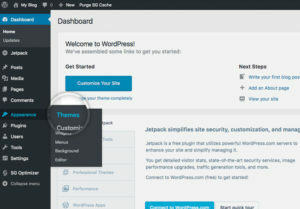 You can also buy and activate the WordPress.com Theme Showcase. You will have the alternative to pick which one of your site you need the theme for. In case you might want to utilize a similar theme over different websites, then you are supposed to buy the theme for each different blog separately. When you buy a Premium theme, it is accessible for the lifetime to that blog. Once in a while, we may choose to change a Premium theme since it’s out-dated from a visual or functionality viewpoint. If that happens, you can keep on using the theme as long as you like, however in case if you change to another theme you can’t change it back to previous one. To apply all the above instructions, you need to download the theme first. Along with the particular highlights and a dazzling design, obtaining a Premium theme for your WordPress.com site gives you full access to devoted help on the WordPress.com forums, where you may also discover customization tips for your theme. Basically, the theme creator team provides every possible help and support to you for any issue related to Premium WordPress theme. Theme customization is one of the best features provided by premium themes. You can change colours, font family, images, content, set map location via latitude and longitude, as per your wish. So to get all the above benefits, you need to start with your customizations. How to Access the WordPress Customization Page? Depending on the theme you’re using for your WordPress site, there are the different sets of changes you can make to your site from within your admin panel. Following instructions will show you how to do some of the changes to your site using the Customization page. To start customizing your WordPress theme, first go to Appearance -> Themes page. On the page that opens, you can modify your WordPress theme in real time. On the left, you will see a list of the available options and on the right a live preview of your site and how those changes will affect it. 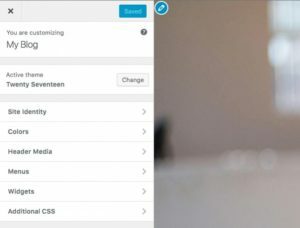 On this page, locate the active theme (Twenty Seventeen in our case) and click on the Customize button next to its title. On the page that opens, you can modify your WordPress theme in real time. On the left, you will see a list of the available options and on the right a live preview of your site and how those changes will affect it will be shown. The theme customization page allows you to modify your site’s title and tagline and see how it will look on your actual site immediately. To do this, expand the Site Identity group of settings and alter the text. As you type you will see the new text showing up in the preview on the right side. Once you’re satisfied with the result, simply click on the big Save & Publish button. If a Premium theme does not work out properly, a complete refund would be offered up to 30 days from your purchase. To terminate your buy and acquire refund, please use Cancel button on the Purchase page. You can also change to some other Premium themes or one of the other fabulous free themes. There is an inclusion of increasing free themes which are supported as well. WordPress Plugins to Improve SEO. The aspect which refers to the process of improving traffic to given website by increasing the site visibility Websites improve search engine optimization by improving content, making sure that the pages are able to be indexed correctly, and ensuring that the content is unique. A plugin is an aspect of a software holding a bunch of functions that can be integrated into a WordPress website. It’s also a way to extend and add the functionality to the new website. There are several plugins for the different task. But nowadays WordPress has become the most used content management system. WordPress hosts nearly 30% of internet websites. If you are the user of the WordPress then take a look at the most powerful plugins which improves the SEO of the website. This is one of the most popular WordPress plugins that is used to optimize an entire website. It shares some of the features of All in One SEO Pack, as it is direct and starts working right away, but its interface is a bit more departmental. Easily generate sitemaps and improve your site navigation, improving your user experience. It generates the headings and snippet of 320 characters tagged in HTML and gives an internal connecting tip. The snippet preview feature shows you how your post or page will look at the search results both on desktop and mobile. Optimize your web pages for targeted keywords. The bulk editor can help for large-scale edit of the sites. It has the capability to make use of Local SEO and has the helping hands of Google maps for campaign Marketing. A well versed and customized 404-page plugin. It is the precise solution to handle all those error pages that disturb the users and reduce the whole user experience. The 404page plugin allows you to create a custom 404 page with ease. The best part of it is doesn´t create any redirects or additional server requests. It is compatible with the most used WordPress Themes. WOT is a cache plugin that makes the best or most effective use of your WordPress speed. It feeds an up to date version of your website in the browser´s cache, effectively reducing load times. WOT Cache completely contributes to your website without compelling any technical terms. It assures page caching, It helps to load the page faster which results in higher conversion and sale. Automatically detects the images on your website. Helps with file compression and zip compression which helps to save the bandwidth. With the help of lazy load, videos and images are loaded only when the user scrolls down the page. Handles browser caching and entire database optimization. There might be several options where a need for proper redirection can’t be avoided. With the use of the Redirection plugin, a user can easily handle 301 redirections and keep a record of 404 errors. This improves the overall user experience and the result is increased rankings. It sets the condition switch, based on specific criteria. We can easily see the changes and redirects happening on your site. The plugin hit-counts each and every change or redirect. WordPress is fairly an active platform to build websites. It is the most effective content management system throughout the web industry. It is very simple to install and use to uphold a blog or website. WordPress websites are very easy to sustain as there is no need to understand any kind of programming or HTML deeply in order to keep up with the content. Just with some little proficiency in CSS and HTML, you can do wonders with your website. A WordPress theme is a group of templates and style sheets that are used to describe the presentation of the WordPress driven website. They can be altered, managed and enhanced as per the requirements from the WordPress admin area. These themes are varyingly created to deal with several categories of the website. They can be modified by the addition of plugins or code. This is the most preferred platform for web designers and bloggers as you can start their business website or blogging site with very few clicks by installing WordPress in association with the required plugin. WordPress themes are specifically known for their robust functionalities. Your theme can have unusual designs like stationary or responsive, using one column or two. Your theme can show content on the website wherever you want to display it. You can list programs and events to make your content perceptible. Numerous themes and widget are ready to use and allow you to add several functions to your site. 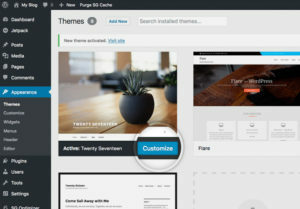 Hundreds of WordPress themes are available on WordPress.org; those are free, responsive and premium. Free WordPress themes are simpler to install. This gives you a liberty to try your hands on numerous free themes till you get the one which meets your requirements. Free themes have so many variations in their quality and functionality. 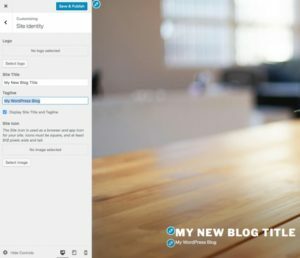 You can easily discover free themes on WordPress.org. Over 1700 free themes are available on the web. The only drawback is that they may not be compatible with the latest version provided by WordPress. They may contain bugs or viruses which make your blog or website prone to hackers. This may not the case with every theme but is important to keep in mind while choosing a free theme. Responsive themes always come with a user-friendly installation where your blog/site adapts itself in accordance with the user’s display resolution like PC, mobile phones, tablet, or iPad. Because of the increasing interest of users in mobile phones and ipads, responsive themes are more versatile for better business growth. An amazing feature of responsive themes is that they allow you to save the look and style of your blog or site when viewed on any type of screen. Premium WordPress themes need to be purchased. They have better features as compared to free ones. The foremost important aspect that makes premium themes unique is the customer assistance from the support team. They have greater functionality, navigations, and inbuilt plugins. The presence of their robust features leads to the increasing demand for premium themes in the market. This has actually made the purchase of this type of theme more affordable. There are several web owners that offer well-designed premium themes with proper coding, SEO friendly that is good for blogs and similar websites. Several publishers have released these outstanding premium themes like themescaliber for their excellent performances. Apart from the theme classification, there are so many advantages provided by WordPress themes. WP themes are Cost Effective; Gone are the days when making a site will cost you a huge amount of money. WordPress planning and improvement are really cost effective. Likewise, the upkeep and support cost is moderately cheaper as you can do it without anyone’s help, whenever you have to refresh the content of your site. You can refresh your site anywhere. If you choose to create WordPress Theme Website, you can roll out improvements to your webpage anywhere you access the Internet. They are SEO friendly. Sites assembled utilizing WP has straightforward and steady codes making them perfect for Google ordering. Website design enhancement parts for each page can likewise be redone giving you full control on which pages you need to rank high in web indexes (i.e. You can focus your SEO campaigns around high converting pages). They provide helpful syndication. This is a very proficient approach to acquire inbound connects to your site. Each time you post another blog section, it can consequently go to an RSS channel, making it less demanding for others to collect your content crosswise over indexes and different sites. Responsive website designs are never again an alternative, however, an unquestionable requirement. When you utilize a WordPress web design, you consequently get the advantage of responsive web innovation without the need to create separate sites for different devices. Update the capabilities of your site easily. Adding new highlights and functionalities can be to a great degree of loading for customary sites, particularly those that are made utilizing refined stages. This is the correct inverse for WordPress-based locales. There are modules that you can introduce which regularly make only three strides. Further, the WordPress team is extremely dynamic and relatively report the best practices. Most of the WordPress themes have several customization options. If these options are not programmed wisely, then it will become a very tedious task for you to change the customizations or operate plugins. To overcome these issues, following are some tips that can help you to use these themes wisely. WordPress themes come with complex designs, colours and glitzy animations. You may need all such aspects but in most cases, you don’t. You can search for a theme that meets your requirements without adjusting your simplicity and functionality. Responsive themes adjust their designs across different displays or devices. This will give rise to the meaningful web traffic that is generated from handheld or mobile devices. You may get many users who opt to use different search engines. Hence your WordPress theme should be compatible with all the search engines. This tuning between your theme and search engines is very important for your business; else all of your efforts will go waste. The plugins provided by WordPress are the real heroes for WordPress themes. With the help of these plugins, you will get a greater flexibility for better customizations and functionality of WordPress themes. So you need to try hard to get as many WordPress plugins as possible. Some of these include Yoast SEO, Gravity forms W3 total cache. Page builders are the plugins on WordPress that help you to build different page designs for using a drag and drop interfaces for its users. Some of the themes come with these inbuilt page builders. Specifically, they are used by developers only. These builders are created for landing page only as it produces codes. Hence having knowledge of page builders is very important. These tips will help you while working with WordPress. Use WordPress themes to make the most out of WordPress. These themes will be helpful in creating a brand for yourself and can also dignify your writing talent. WordPress themes have become an influential and easy to use platform. These are established to serve as an ideal Content Management System (CMS) for businesses or any individual organization to manage their site content. WordPress is started out as a highly advertised and beneficial content management system. WordPress came out to be a helpful platform for bloggers, as it is free and can support any individual to build outstanding websites for better revenue from their business. WordPress enables you to create and alter the written content of your website. It is oriented with different search engines such as Yahoo, Google, and Bing. It is greatly fortified and adaptable to tackle almost any type of task offered. This results in its increasing popularity. WordPress includes so many themes that give you the ability to create a website with different appearances, features, and functionalities. A Perfect WordPress Theme will facilitate you to build a website that meets your requirements. A smart theme platform like WordPress, will offer you customizations, the best quality style elements, flexibility, full compatibility with search engines and simplicity in functioning. Some important factors that the entire top WordPress theme possesses are listed below. Hooks are utilized by different WordPress plugins in order to be able to perform their desired operations within the theme. Hooks can facilitate you to give extended output, trace codes to make changes in the child theme without disturbing previously made alterations and appearance of the theme. In case a designer fails to add these hooks in the theme, then it will result in so many problems. So make sure that the theme you are choosing has hooks. While searching for the Top WordPress themes, take into account to compare the theme files. There are countless files that would also include homepage template, single posts templates, pages, category indices and many more. With this comparison, you will be able to differentiate the best theme from the rest. Sidebars in WordPress do not support widgets. This protocol will make you control your sidebar from admin panel without disturbing your theme. Unfortunately, all the themes on WordPress do not support this incredibly amazing tool. Only Top WordPress themes support this feature. So choose wisely. The foremost important aspect of any theme is its navigation bar that gives proper direction to your user towards their desired location. Sadly all the WordPress themes do not have inbuilt navigation boxes. Thus make sure that your theme should have built in the navigation box. Last but not the least is the compatibility and the themes to work on all search engines .To check their availability, take the demo site of a theme and place its URL in the link to receive screenshots of all major browsers on all stages. These are some important aspects of Top WordPress themes. To drive quality traffic towards your website to earn a good profit, all the above-mentioned factors should be kept into consideration. There are Numerous Top WordPress themes available on WordPress.org with smooth functionality and robust features explained below. Sydney is an influential theme that gives a quick way for the firms or individuals to make a great online presence. It consists of so many customization options such as access to Google fonts, colour control, logo upload, screen sliders, header image, advanced navigation bars and many more. It provides all the building blocks required to design an engaging front page. With 2014, you can build a responsive magazine website with its default theme. You can design your desired homepage in either a grid or slider form. To showcase your creators, you can use three widgets areas to customize your site and alter your content’s layout with a full page template. It is an incredible solution to create multipurpose online shops like the online bookshop, sports shop, electronic item shop, mobile and tablet shop, apparel shop, cosmetic shop etc. It also consists of different ventures such as travel, technology, construction, restaurants, corporate companies, bloggers etc. It is built on Bootstrap that makes it a perfect foundation to sell e-commerce products. This customized responsive Woo commerce WordPress theme offers different options to simplify the task of website development. The incorporated social media feature makes it a multi-functional theme and greatly interactive on social sites. With numerous customizations, this user-friendly theme makes a perfect fit for your sophisticated e-commerce site. Twenty Seventeen breathes life into your site with header video and immersive included pictures. With an attention on business websites, it includes various areas on the first page and additional widgets, navigation and social menus, a logo. Customize asymmetric framework with a custom shading plan and showcase your multimedia content with post positions. Our default theme for 2017 works incredibly in numerous languages, for any capabilities on any device. OceanWP is the ideal theme for your venture. Lightweight and very extendable, it will empower you to make any sort of site such a blog, portfolio, business site and Woo Commerce forefront with a wonderful and professional outline. Fast, responsive, RTL and translation ready, best SEO practices, unique Woo Commerce features to increase conversions and many more. You can even alter the settings on tablet and mobile so your site looks great on each device. Work with the most well-known page developers as Elementor, Beaver Builder, Visual Composer, Divi, SiteOrigin, etc. Developers will love this extensible codebase making it a fun to customize and extend. It is obvious that WordPress is a fabulous blogging and website building platform. So it’s important to consider the requirements of your website, to get the desired theme. Above mentioned features and examples of Top WordPress themes will give you an idea to select beneficial themes for designing an attractive website to earn better profits. How to Select a Best WordPress Theme and Templates? WordPress is considered as one of the most popular and user-friendly blogging platform. Most of the articles and write-ups available online are created via WordPress. The wideness of this platform is not limited to its fine blogging features but further, it has stretched to all the possible limits and extends its presence as the leading platform for creating different types of websites. Its wide variety of themes helps businesses to showcase their products and services in best possible ways. WordPress allows you to build highly professional and appealing websites in less time and resources, even those who are not so techno-savvy can create an excellent website with the help of this amazing and user-friendly platform. WordPress is easy to use and you have a wide variety of themes to choose from, which will help you to represent your business in a professional and effective way, online. For an amazing online presence, you need a website with a professional theme that helps you to promote your products and services in an effective and organized way. Getting a perfect theme that suited best to your offerings and fit-in into the exact requirements you are looking for might be a tedious job. In WordPress, where hundreds and thousands of themes are available, you can get the one you are looking for, quite easily. There are several free themes available on WordPress, you can choose any of them that suits best to your requirements. If you are looking for some specific features and functionalities along with some customization, you can opt for the premium themes. Here are some of the important factors to keep in mind, while selecting themes for your website. Being Simple: – Simplicity is considered to be the best available option to showcase what you want in an elegant way. When it is about choosing themes, it is important to consider the technical knowledge. If you don’t have knowledge of coding or you don’t know how to modify themes by CSS or HTML codes, it’s better to choose a customizable theme in that case. Customizable themes are easy to use as they do not incorporate with any kind of complicated codes. Compatibility: – It is important to choose a theme that suits best to your website’s object. The theme should always go with the subject and must compliment the same, both features and looks wise. Additionally, your theme is supposed to be compatible with all the search engines and maintain a similar outline. There are several compatibility tools available online, which can help you to check the theme compatibility. – The privilege of getting a perfect theme becomes extra joyous when it offers you more than the basics. In other words getting features that you are really looking for would double the excitement of getting an amazing theme. Without a doubt, support is one of the most important features that most of the theme buyers on WordPress usually look for. It is important to get immediate assistance wherever you encounter problems related to your website and to address the same you need excellent and dedicated support team from the other end. SEO Friendly: – It is important to build a search engine optimized website to earn the higher ranking on search engines. When it is about WordPress themes, it provides wide possibilities in the design flexibility and optimization. But these utilities are limited to premium themes and not available for most of the free WordPress themes. So, if you are concern about the website rankings and want to showcase it somewhere on the topmost search engine results, you must build an SEO optimized website. Finding a diamond in a heap of stones can be a troublesome job. Likewise, looking for a Best WordPress theme is a tedious job too. So to overcome this issue, following are the tried and tested steps to find a perfect theme for the website. Be specific about your requirements. There are several business based themes available on WordPress, if you are not specific about the looks and features of your website, you will end up getting nothing perfect. Jot down the features and looks you would like to have for your website, search it accordingly on the WordPress to ensure you get the best of the available options. Be specific about the features you want on your website. Most of the WordPress themes are well-equipped with the standard features; you can customize them as per your requirements. It allows you to change the color, font, and arrangements as per your preferences. The best practice is to keep the features limited. Add the required features to keep your website simple and to-the-point. Be clear about the style you want for your website. As WordPress is flooded with the wide variety of options, you have to be very specific to stay focused and get what you desire. From professional, fun, modern, innovative and high-tech, the list of themes on WordPress is endless. Choose the one that suits your business the best. So it will be easy for website visitors to relate in an easy and effective way. Settle on your favorite WordPress theme. In case you find a theme that is well-equipped with all the required functions and functionalities you are looking for but you don’t find the theme attractive enough to match your needs; you can customize the layouts. For this, it is important to check whether the selected theme incorporates various designs or not. See theme demos. When you look for theme demos, you will get a real-time idea of how the theme will work. You can easily judge its ease of accessibility and smoothness along with how user-friendly the theme is. These are few of the things that one should keep in mind while choosing a WordPress theme for their website. As the wide varieties of options are available both in free as well as premium themes, you can easily get what you have desired for your website. Whenever you are creating a WordPress grounded website, the foremost important task for you is to find an appropriate WordPress theme. WordPress themes give your website an identity. Themes can make your website unique. Though you can settle with the default theme that comes in synchronization with standard WordPress installations, still you can explore a theme which is flexible, customizable and fun to use. You will be astonished to see thousands of free and premium themes available on WordPress. There are different methods to find a perfect WordPress theme for your website. The simplest and the most obvious is to Google search. An alternative way to find a theme is WordPress.org site. Here you can search a theme through huge databases available, you can filter your choices by using keywords like” free themes” or “premium themes”, etc. WordPress supports each theme designer to bring up their own installation instruction for their theme. To use your theme correctly, read the direction of installation before installing your theme. While choosing a theme for your website, you need to consider the foremost important purpose of the blog, so that your theme will be aligned with respect to the objective of your website. Primarily there is two type of theme available one is Free WordPress themes and the other one is premium WordPress themes. There have been so many debates over free WordPress theme against premium WordPress themes. Well both the categories are suitable to work with, depending upon the type of site you are planning to build. In the following, we will discuss the advantages and disadvantages of utilizing free WordPress themes against premium WordPress themes. Free themes have very easy and generic design without any complications or complex structure. They are simple to understand and easy to function. It is free!!! That is the biggest advantage as there are no monetary risks associated with utilizing free themes. In case you don’t like the functionality or features of your installed theme, then you have got the complete liberty to opt for other available free themes. Some free themes have got customization options, to manipulate the theme as per your wish. Free themes are not facilitated with the latest updates. That is the reason why they are least compatible with the latest version of WordPress. None of the assistance is available from the support theme. In case you face any difficulty regarding installation or functionality of the free theme, no help is provided from developer’s side. You need to solve your queries on your own, which sometimes becomes a most tedious task and may create a lot of nuisances. Free themes are decent up to personal blogging level only. They definitely will create a loss to the bigger organization through their lack of features and functionalities. If you are a business owner and planning to create a professional business site, then a Premium WordPress theme will be the better option for you. Premium themes are developed by the team of professional web developers. Hence, the premium themes are reliable and sophisticated. To maintain their reputation, none of the developers will try to risk their brand by creating an inferior product. Their only aim is to create a group of satisfied and loyal customers. This can be achieved by developing outstanding premium themes and by providing complete customer support. Premium themes are more professional, elegant, polished and classy with their robust features as compared to free themes. Premium themes are filled with ample features to meet your website requirements. You are provided with full customer support assistance from the developer’s team. If you have any queries regarding themes, no need to worry as support forum respond any of your queries within 24 hours. Complete technical help is provided to you whenever you need it. Virtually all the premium themes come with customization option which enables you to make any changes with some clicks. You can execute some basic customization by yourself such as changing your website font or colors, background images etc. Unlike free themes, you don’t need to understand the coding techniques to make small changes to your site. In fact, you don’t need to understand anything about coding as customization in free themes is as simple as ABC. WordPress themes can take your site to another level of advancement. They offer a professional look to your website. You can explore through the huge WordPress.org database or browse over the web to find a preferable theme for your website. If you are a business owner and serious to set up a remarkable website which will help you further to draw more visitors, than you need to invest a huge amount of money on web designers and developers to develop your site in an appropriate way. Whereas on the other hand premium theme will cost you just a small part of that amount and still gives you better revenue for your business.